Little Arebe Abdo stood quietly by the Bethany School gates in Bekoiji, Ethiopia. It was Friday afternoon and home time, but she was not part of our programme. Anxiously she waited for Girma our health worker to leave school and removing her top, she showed him a massive growth on her upper right arm. There was sadness in her eyes as she stood there alone, in pain, hoping for help. Girma took Arebe to Asala Hospital, just over one hour’s drive away and the decision to operate was taken. Blood was purchased and on Tuesday 20th October 2011 three doctors performed surgery on little Arebe for over four hours. 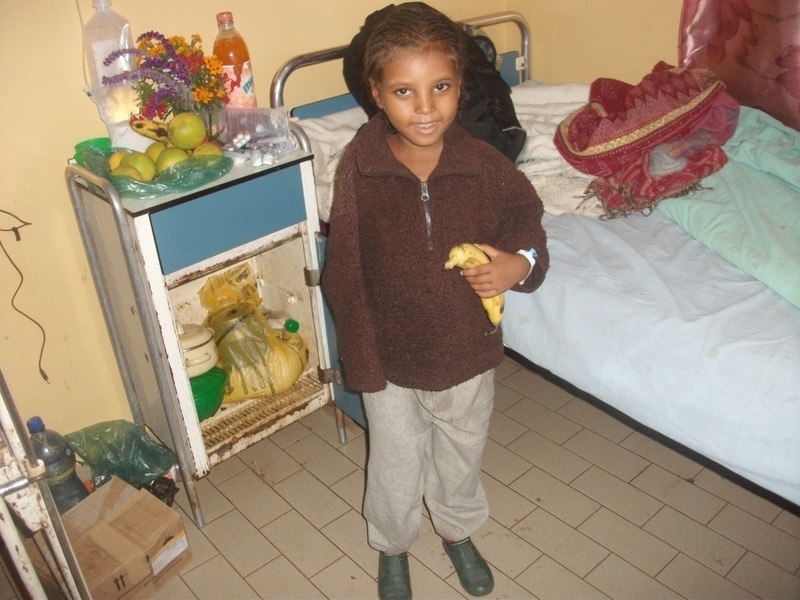 Sadly her right arm had to be removed as the tests showed that the growth was cancerous. Within just a few days, with her pain under control, enjoying good food and constant care provided by our health worker, Arebe is making good progress and is even smiling. We now wait anxiously for news regarding the cancer and pray it is not malignant. Whatever the outcome Arebe will now be cared for by Stand by Me and we will do the best we can to provide love, care, education as well as emotional and medical help. This is just the beginning of our relationship with Arebe. Life for any child in Bekoiji is tough, but for a child with only one arm, the future could be bleak. Arebe will now be part of our programme. In a town with extremely limited health care, Arebe’s plight further emphasises Stand by Me’s need to extend our health care provision so that sick and vulnerable children like Arebe are cared for sooner. On October 21st 2011 a UK nurse from Northern Ireland will be working in Bekoiji helping to improve our health programme and care for Arebe.